Solid-fueled rocket motors for the next Pegasus mission will arrive at Orbital ATK’s Vandenberg processing facility as soon as next month, with preparation activities picking up soon after the launch of the last Pegasus rocket over the Atlantic Ocean Dec. 15 with eight NASA hurricane research satellites. The eight Cyclone Global Navigation Satellite System spacecraft launched by the Pegasus rocket will measure winds inside hurricanes, giving scientists insight into their formation, intensification and life cycle. 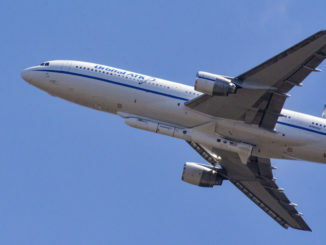 Orbital ATK’s L-1011 carrier jet used to drop Pegasus rockets before they fire into orbit flew from Cape Canaveral Air Force Station’s Skid Strip runway, the staging point for the CYGNSS launch earlier this month, back to its home base in Mojave, California, on Dec. 16. 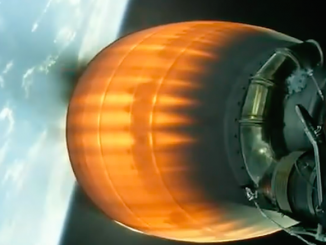 The next Pegasus flight, which will be the 44th satellite launch by Orbital ATK’s air-dropped booster, will haul up NASA’s Ionospheric Connection Explorer, or ICON, satellite. ICON’s launch is tentatively set for June 15 from a point over the Pacific Ocean near Kwajalein Atoll in the Marshall Islands, heading for a 357-mile-high (575-kilometer) orbit to observe Earth’s ionosphere, where influences from terrestrial weather and space weather meet. The Pegasus rocket’s airborne launch platform will remain at Mojave until heading to Vandenberg in the spring for attachment of the three-stage booster. Then the L-1011 TriStar carrier plane will ferry the rocket to the Reagan Test Site at Kwajalein for the final days of launch preps. 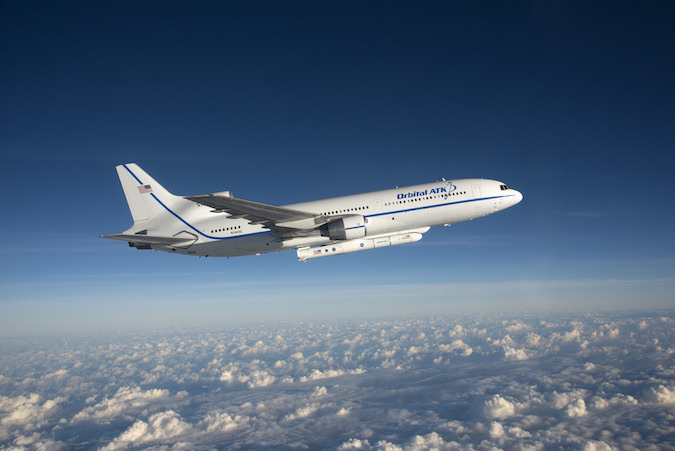 The aircraft, nicknamed Stargazer, has supported Pegasus launches staged from Vandenberg, Kwajalein, Cape Canaveral, Wallops Island in Virginia, and the Canary Islands. The modified jetliner was delivered to Air Canada by Lockheed in March 1974, then purchased by Orbital ATK in 1992 for Pegasus missions. Its cabin seating has been removed, leaving only a handful of control consoles in the forward fuselage to oversee Pegasus launch operations. The widebody airplane has a twin hull, allowing the Pegasus rocket to fit snugly underneath the L-1011 with room for the launcher’s aft-mounted control fins. Details of Pegasus’s future may still be unclear, but Orbital ATK has struck a partnership to supply at least two of the solid-fueled rockets, and maybe more, to the Stratolaunch venture led by Microsoft co-founder Paul Allen’s Vulcan Aerospace. Stratolaunch announced an agreement with Orbital ATK in October to launch Pegasus rockets from a giant six-engine, twin-fuselage aircraft under construction in Mojave, California. Artist’s concepts showing the carrier rig show the airplane lofting three Pegasus launchers in one flight. 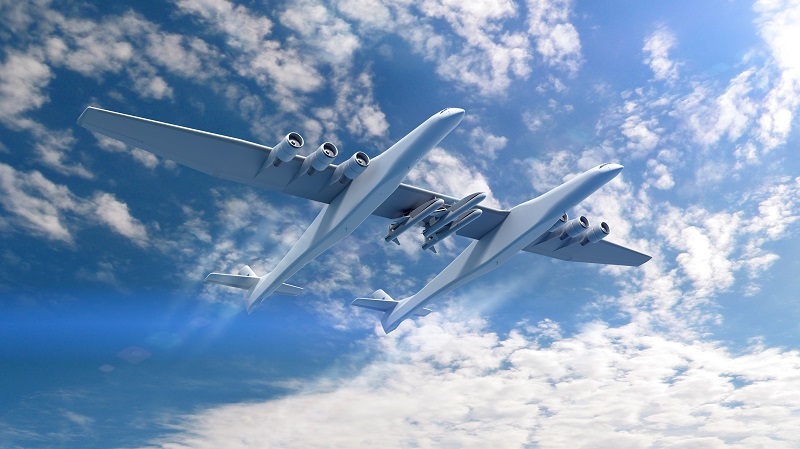 Stratolaunch has not disclosed how the company will use the Pegasus rocket, but the press release announcing the “production-based” partnership said it would offer “significant cost advantages” to air-launch customers. An official familiar with the agreement said Orbital ATK will not only provide the three-stage Pegasus XL vehicles needed to launch satellites from Stratolaunch’s carrier aircraft, but also a team of engineers and technicians experienced in assembling the rockets and conducting launch operations on an airborne platform. The Pegasus rocket has 29 straight successful satellite delivery missions, but the small satellite launch market in the United States has dried up in the last decade due to rising launch costs and new lift options taking the place of Pegasus. Orbital ATK’s Minotaur 1 and 4 rockets, powered by decommissioned Minuteman and Peacekeeper rocket motors, have launched many of the U.S. military’s experimental satellite missions since 2000. 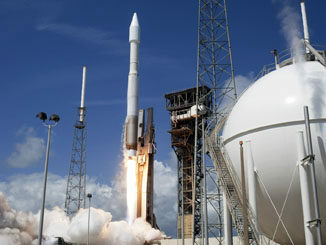 The Minotaur is less expensive than the Pegasus, and it can carry heavier payloads, but use of the stockpiled missile motors is legally limited to payloads for the U.S. Defense Department due to concerns that flooding the market with government-furnished rocket stages could spoil commercial launcher development. There are few U.S.-owned commercial satellites in the Pegasus rocket’s light-lift class. Most new privately-owned low-Earth-orbiting spacecraft have taken advantage of technological leaps in miniaturization, with many fitting into shoebox-sized CubeSat form factors. Global market forces have also taken shape to edge Pegasus out of the market, with upgraded Russian ballistic missiles like Rockot and Dnepr snatching up many commercial small satellite launch contracts in the 2000s. More recently, Europe’s Vega rocket and India’s Polar Satellite Launch Vehicle have won larger slices of the market. Rideshare opportunities are also growing, allowing many small satellites to fly on a larger rocket to pool launch costs. In the last 10 years, Pegasus rockets have flown six times. The air-dropped launcher flew into orbit 28 times from 1996 through 2006. But Pegasus remains a stalwart in NASA’s launcher fleet. 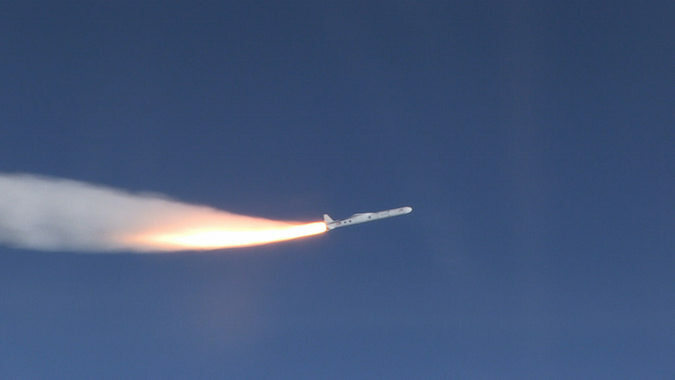 It is the only light-class booster certified to launch the space agency’s most valuable, risk-averse science missions, and it occupies a place in the lift spectrum between the capabilities of new commercially-developed “micro-launchers” like Virgin Galactic’s LauncherOne and Rocket Lab’s Electron, and the capacities of bigger rockets. Rideshare launch options for NASA’s research satellites are hard to find without sacrificing scientific observations or compromising on the mission’s orbit. NASA will soon select a new space mission in the agency’s “Small Explorer” line of science satellites for launch by the end of 2020, and all three finalists in the competition are designed for launch on Pegasus rockets. Two of the candidate proposals, IXPE and PRAXyS, would peer into energetic stellar factories and graveyards across the observable universe to study how the mysterious regions behave and emit X-ray signals. The SPHEREx mission concept would scan the sky with an infrared telescope for at least two years from a perch in low Earth orbit in a bid to study inflation, the theory that the universe grew in an instant from a speck to exponential size just after the Big Bang. While IXPE, PRAXyS and SPHEREx are intentionally sized to fit inside the volume of the Pegasus rocket’s payload fairing, NASA will select a launch vehicle from its stable of approved rockets for the winning mission some time after announcing the selection. Bryan Baldwin, Orbital ATK’s Pegasus launch vehicle program manager, told Spaceflight Now the company is still pursuing new opportunities for the rocket. The Pegasus XL and Orbital ATK’s ground-launched Minotaur-C rocket, a commercial Minotaur variant formerly known as Taurus, are the only vehicles in the NASA Launch Services contract approved to loft the agency’s small-size satellites. NASA is also evaluating proposals for a new heliophysics “Small Explorer” mission to follow IXPE, PRAXyS, or SPHEREx with a launch in 2022, but that project could take advantage of an observation post on the International Space Station and launch aboard one of the research lab’s robotic supply ships rather than on a dedicated rocket.